Property 38: The villa is on the beach side at Cap Malheureux, the dream spot of Mauritius. 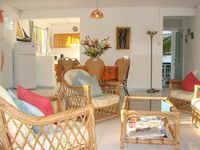 Property 39: Airconditioned room wit kitchnette ideal for individual, family and groups. Property 46: Spacious Private Duplex Villa PROMO £60 MAY-JUNE 2019(2-8 PAX)Pereybere. Property 50: PENTHOUSE, waterfront with a stunning view over the Coin de Mire.